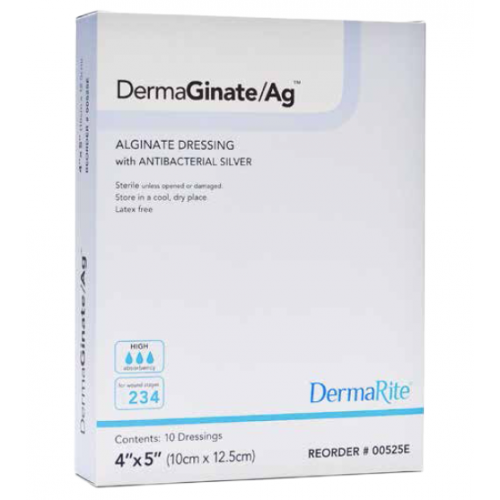 DermaGinate Ag Alginate Dressing with Antibacterial Silver is a calcium alginate wound dressing used as a topical wound dressing for exudating wounds. Highly absorbent, DermaGinate/Ag provides up to 3 days of continuous protection. 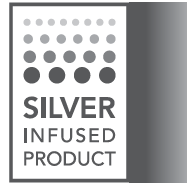 The Silver Ag composition of this dressing provides antibacterial protection. DermaGinate/Ag Calcium Alginate Iconic Silver Dressing is used for infected wounds. DermaGinate Dressings can also be used on wounds suspected of possible infection. 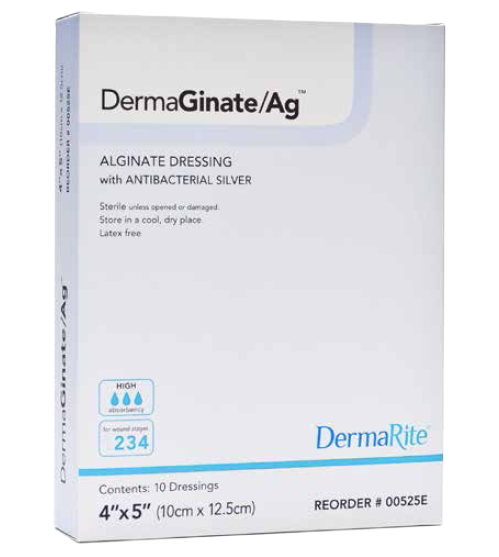 Manufactured by DermaRite, DermaRite DermaGinate/Ag Dressings absorb 12 times its own weight in fluid. These Calcium Alginate Dressings provide an excellent topical Wound Dressing for moderate to high exudating wounds. DermaGinate Dressings are adaptable to any Wound Care area on the body. Contains antibacterial silver to treat infections. Designed for moderate to high exudating wounds. Provides 3 days of continuous antibacterial protection. Flexible dressing conforming to any body area. Product Numbers: 00520E, 00525E, 00530E, 00535E. Size Options: 2 x 2 Inch Square, 4.25 x 4.25 Inch Square, 12 Inch Rope, 2 x 8 Inch Rectangle. Orders can be placed through our website, vitalitymedical.com, or over the phone at 1-800-397-5899. If the product is being shipped internationally, you will have to check out using our "International Checkout" button. It is located on the cart screen. DermaGinate is a great combo dressing with both Calcium Alginate and Silver to fight infections.